Patients, visitors and hospital staff are welcome to use the services of Fourth Floor Salon. Trained to help you look your best so you can be your best, our professional stylists specialize in a variety of services for hair, skin, and nails. The salon also carries a range of styling products, which are available for purchase. A 15 percent discount is available to inpatients on all services, and some salon services are available at the bedside for patients. Shampoos, cuts, styles, and detangles are available without charge to inpatients who would benefit and whose financial situation makes payment a challenge. Please speak with your nurse about requesting a salon service without charge. 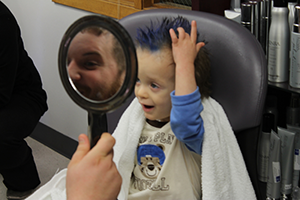 Learn more about patient salon services and programs. Tuesday through Friday: 8:30 a.m. to 4:30 p.m.